by MERKS: Day 161, outfit 161. Today, I'm wearing some classics which every man need. A basic white shirt, a leather jacket and a good skinny jeans. Also a pair of good sneakers and a leather bag. 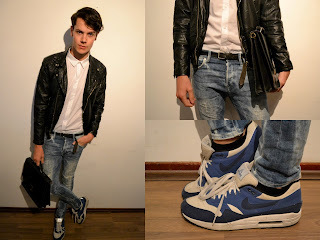 The shirt is form Weekday, jacket from Zara, jeans from H&M and my Nike Air Max 1's.